Maurice Murray, Jose Mendoza and Zachary Wilkerson each scored touchdowns as the Pahrump Valley Warriors defeated the Faith Lutheran Crusaders 20-6 in a National Youth Sports Nevada 13U football game Saturday at Faith Lutheran High School. Tom Rysinski/Pahrump Valley Times The Pahrump Warriors 13U football team takes the field for a game earlier this season at Trojan Field in Pahrump. The Warriors defeated the Faith Lutheran Crusaders 20-6 last Saturday to improve to 5-1. Wilkerson ran for 70 yards, including his 49-yard touchdown run during the fourth quarter, and threw for 50 yards as the Warriors improved to 5-1. Murray opened the scoring with a 25-yard run in the first quarter and pushed that to 13-0 on Mendoza’s 4-yard scoring burst. Mendoza rushed for 55 yards as the Warriors totaled 171 yards on the ground. The Crusaders closed the gap with a fourth-quarter touchdown pass before Wilkerson’s touchdown iced the game for the Warriors. In the 11U game, Cory O’Neal recorded a safety, but that was the only scoring for the Pahrump Junior Trojans (1-5) in a 19-2 loss to Las Vegas Union (2-4) at Liberty High School. Banner Dawson and Austin Alvarez each recovered a fumble for the Trojans, who were held to 47 yards of offense. 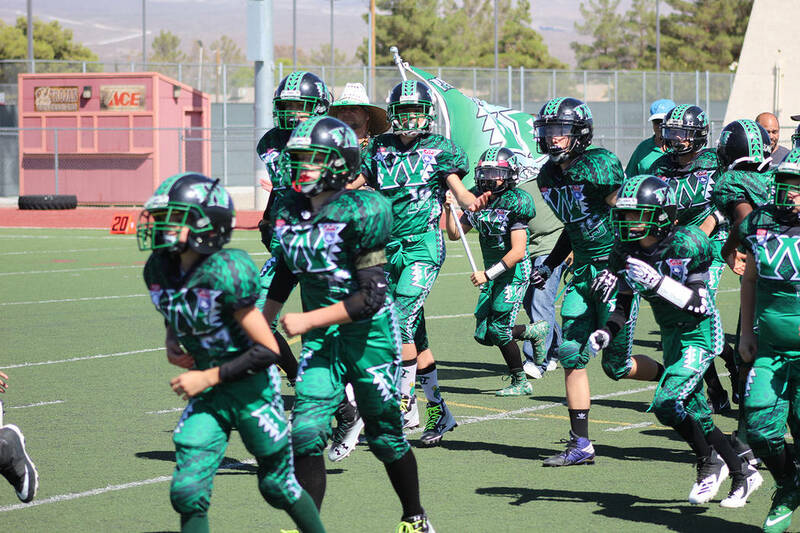 In the 9U game, the Junior Trojans managed only 16 yards of offense in a 26-0 loss to the undefeated Liberty Patriots. Pahrump fell to 2-4, while the Patriots are 6-0.